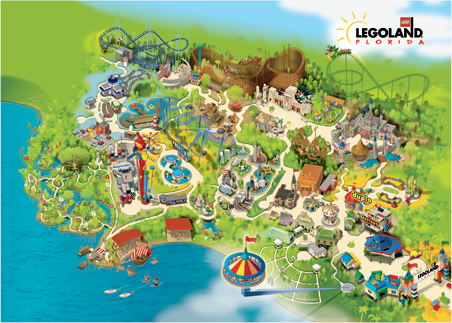 LEGOLAND® Florida, opening October 15th, 2011, is a 150-acre family theme park located in Winter Haven, just 45 minutes southwest of the Orlando theme parks or downtown Tampa. The Park will offer interactive attractions, family rides, shows, restaurants, shopping and beautiful landscape specifically geared for families with children ages 2 to12. There are four other LEGOLAND Parks in the world – LEGOLAND® Billund in Denmark (opened in 1968), LEGOLAND® Windsor, outside of London (1996), LEGOLAND® California in Carlsbad (1999) and LEGOLAND®Deutschland in Günzburg, Germany (2002).